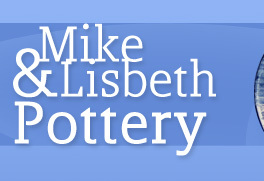 Mike and Lisbeth custom design and paint a large range of hand thrown ceramics, including studio pottery, majolica and oven proof ware. 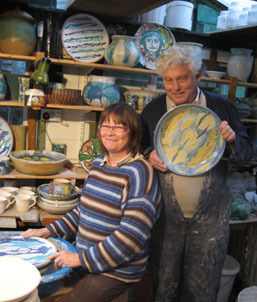 People who like our pots may be interested in reading Mike Strange’s personal story called “War Baby - A Dyslexic Life” His book describes his early memories of crouching in a dugout with his Mother and Granny while German bombers droned overhead, to his evacuation to a remote hamlet in the Welsh mountains, to being blown off a hayrick by an exploding flying bomb near the end of the war. The book covers the years 1938 – 1962 and describes his close family life in post-war Britain and the author’s problematic education and turbulent adolescence as he successfully struggles to overcome his dyslexia and succeeds in gaining the qualifications and experience to become a college lecturer. His story is told with humour and empathy and displays an acute understanding of the strength and weakness of human relationships. War Baby is published by CreateSpace and is available on Amazon Books. You can read reviews of the book by typing in ‘War Baby Mike Strange’ on the Amazon site. The paperback costs £8.99 and the Kindle version £2.99.